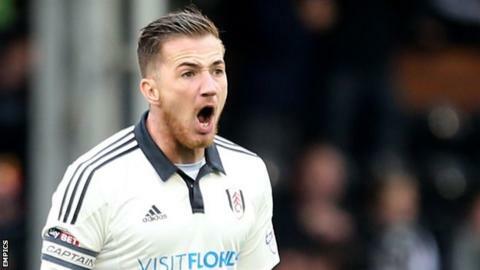 Ross McCormack scored a late free-kick to rescue a point for managerless Fulham against bottom club Bolton. The Fulham captain curled in his 14th goal of the season before striking the crossbar in stoppage time. Full-back Luke Garbutt had given the away side the lead with a low right-footed strike from 20 yards. Zac Clough scored twice to put Bolton in front, finishing from 12 yards and then bundling in Liam Feeney's cross, but McCormack rescued a point. Fulham are without a win since 31 October, but started the brighter team against a rock-bottom Bolton side. French defender Prince-Desir Gouano allowed the ball to bounce and McCormack stole it before teeing up Garbutt to fire home. Alex Kacaniklic then grazed the top of Ben Amos' crossbar with a curling attempt, before Moussa Dembele spurned a good opportunity. Mark Davies played in Clough to finish and make it 1-1 and he doubled his tally with 15 minutes remaining when he turned in Feeney's low cross from close range. McCormack's free-kick levelled things before he hit the bar and Bolton's Emile Heskey fired a late shot wide. The result leaves Fulham, who have been without a manager since Kit Symons dismissal in early November, in 18th place, while Bolton remain bottom and without a league win since 12 September. "Trevor Birch says they will get paid on the 29th but I am not sure how much. "The PFA (Professional Footballers' Association) will allegedly put in the rest. I think there is a meeting with the PFA and Trevor at the training ground on Monday and they will be able to substantiate that. "You can see what's happening isn't overly affecting them; especially in the second half. "It's bound to eat away at them somewhere down the line because of the uncertainty but they haven't really touched upon it. "I cannot be over critical on that performance. We are scoring goals and looking a threat but we have got to stop the silliness at the back because we are giving away cheap goals." "I can't believe I am only talking about taking one point. "Then same again second half. We had a great opportunity to make it 2-0 and suddenly it bites you and Bolton get back in the game. "When they go 2-1 up you are wondering if it is one of those games. And once again we are relying on Ross to hit a 'worldie'. "With the amount of chances we created I should be talking about three points and a good away win." Match ends, Bolton Wanderers 2, Fulham 2. Second Half ends, Bolton Wanderers 2, Fulham 2. Corner, Fulham. Conceded by Darren Pratley. Attempt missed. Emile Heskey (Bolton Wanderers) right footed shot from the centre of the box is high and wide to the right. Ross McCormack (Fulham) hits the bar with a right footed shot from outside the box. Assisted by Ben Pringle. Rob Holding (Bolton Wanderers) wins a free kick in the defensive half. Substitution, Bolton Wanderers. Stephen Dobbie replaces Gary Madine. Goal! Bolton Wanderers 2, Fulham 2. Ross McCormack (Fulham) from a free kick with a right footed shot to the bottom left corner. Alexander Kacaniklic (Fulham) wins a free kick in the attacking half. Attempt blocked. Neil Danns (Bolton Wanderers) right footed shot from outside the box is blocked. Assisted by Mark Davies. Substitution, Fulham. Jamie O'Hara replaces Scott Parker. Attempt missed. Ben Pringle (Fulham) left footed shot from the left side of the box is close, but misses to the left. Assisted by Alexander Kacaniklic. Goal! Bolton Wanderers 2, Fulham 1. Zach Clough (Bolton Wanderers) right footed shot from very close range to the centre of the goal. Assisted by Liam Feeney with a cross. Attempt saved. Emerson Hyndman (Fulham) right footed shot from outside the box is saved in the bottom right corner. Assisted by Ben Pringle. Attempt missed. Rob Holding (Bolton Wanderers) header from the centre of the box misses to the right. Assisted by Dean Moxey with a cross following a corner. Corner, Bolton Wanderers. Conceded by Alexander Kacaniklic. Emerson Hyndman (Fulham) wins a free kick in the attacking half. Attempt missed. Darren Pratley (Bolton Wanderers) right footed shot from outside the box misses to the right. Assisted by Dean Moxey. Substitution, Fulham. Ben Pringle replaces Luke Garbutt. Goal! Bolton Wanderers 1, Fulham 1. Zach Clough (Bolton Wanderers) right footed shot from the centre of the box to the bottom left corner. Assisted by Mark Davies. Attempt saved. Alexander Kacaniklic (Fulham) right footed shot from outside the box is saved in the centre of the goal. Assisted by Ross McCormack with a through ball. Attempt blocked. David Wheater (Bolton Wanderers) left footed shot from the centre of the box is blocked. Corner, Bolton Wanderers. Conceded by Tim Ream. Attempt missed. Liam Feeney (Bolton Wanderers) left footed shot from the right side of the box misses to the right. Assisted by Gary Madine. Attempt saved. Zach Clough (Bolton Wanderers) right footed shot from outside the box is saved in the top centre of the goal. Richard Stearman (Fulham) is shown the yellow card for a bad foul.